What’s up forex fiends!? 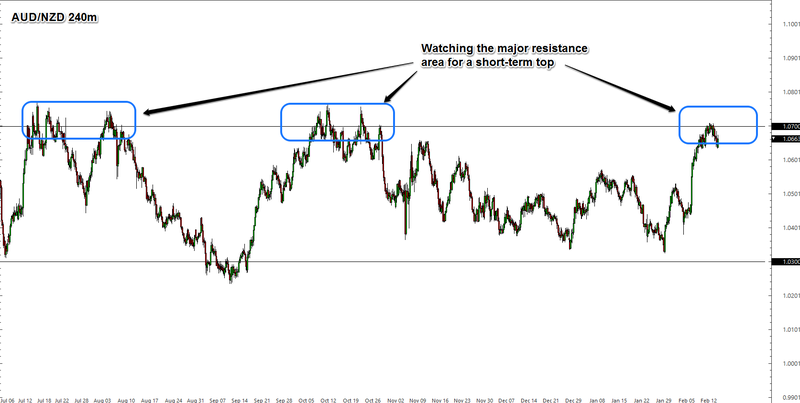 I’m not seeing any new trade ideas at the moment, but this recent move higher in AUD/NZD to previous resistance makes for an interesting short play soon. Thanks to recent positive data from Australia (positive jobs data) and a round of selling after last week’s Reserve Bank of New Zealand meeting, AUD/NZD has finally made it’s way up to the top of a range that goes way back to last Summer. This area around 1.0700 is actually the top of a range that goes all the way back to 2014, and has turned the market right back lower three times since then. We’ve got a high probability sellers will be eyeing these levels, including myself, but I’m not going to hop right in just yet. I do favor the Kiwi over the Aussie for the interest rate differential and growth differential, but we’ve got a slew of Australian events next week (most notably the RBA meeting minutes and Westpac-MI leading index) that could finally give the bulls control over this 1.0700 area. We’ve also got PPI data for New Zealand, as well as the Global Dairy Trade Auction to possibly shake things up with the Kiwi. With so many events for the pair, it’s probably best to hang back for a sec, so I’m in watch mode for now. But I am looking to hop in if the sellers continue to hold and the data comes in weak for the Aussie and/or strong for the Kiwi.